To celebrate my return to Phoenix, I present Monday’s Coffee Spot, Press Coffee at the Skywater Apartments in Tempe, which I visited on my previous trip to Phoenix almost exactly a year ago. Tempe is a separate city southeast of Phoenix, although part of the Greater Phoenix area. 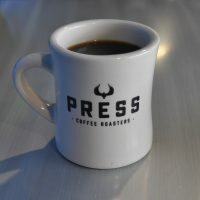 I first discovered Press Coffee, one of Phoenix’s leading roasters/coffee shops, when I fortuitously stumbled across its Scottsdale Quarter branch on my first visit to Phoenix. The Skywater Apartments branch, which opened three years ago, is one of six in the Greater Phoenix area and is located in the Town Lake complex, just back from the southern bank of the Salt River and opposite the Tempe Center for the Arts. It’s a bright, open space, with a lovely, relaxed atmosphere. If you’ve visited a Press Coffee before, then the offering will be familiar. There’s two blends (Twitch and Spitball during my visit) on espresso, with multiple single-origins on pour-over (five during my visit). One of these is also available as on bulk-brew along with another blend, Early Morning, which acts as the “house” filter. There’s also an extensive food served until 14:30, with various egg/bread-based dishes, plus the usual selection of cake. I’m leaving Phoenix today after an all-too-short week-long visit, which included a weekend in the Grand Canyon. However, I couldn’t go without sharing on the unexpected highlights of my stay with you. Speciality coffee is not something I was expecting to find on this trip since I was on business and staying out to the northeast of the centre, in North Scottsdale. However, on my second evening there, having wandered the block from my hotel to the Scottsdale Quarter (I think of it as an outdoor shopping mall), I stumbled across Press Coffee Roasters, which immediately set off my Coffee Spot radar! Press Coffee is a roastery, with a chain of four coffee shops, including one at the airport. What’s more, there are three more on the way! 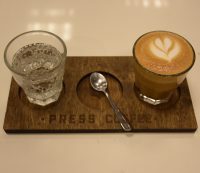 Press Coffee has been going for eight years, with the Scottsdale Quarter branch opening in 2010. There are two blends on espresso, along with decaf, plus five single-origins on filter, made using the Seraphim automated pour-over system through either the Kalita Wave or Chemex. There’s an espresso blend and single-origin on the obligatory bulk-brew, plus cold-brew and nitro cold-brew. If you’re hungry, breakfast/lunch is served until 2.30, with cakes available all day.